Shortly before the end of the year, EDITION F has a reason to celebrate. 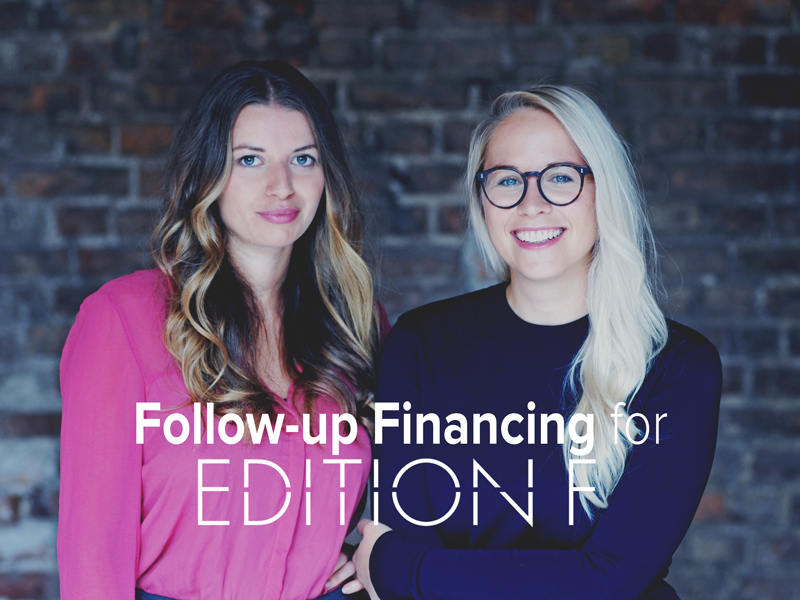 Indeed, the community for ambitious women co-founded by Susann Hoffmann and Nora-Vanessa Wohlert has recently completed a seed financing round, raising a medium six-digit amount at a company valuation of roughly €4 million. During its Companisto campaign, EDITION F was valuated at €1.5 million, so the company valuation and the value of the Companists' shares have more than doubled since the funding campaign. The financing round included one existing shareholder and three new investors: TLGG founders Christoph Bornschein and Fränzi Kühne and Highland Pine Investment GmbH, an investment company run by HR and management consulting firm Kienbaum Consultants International. "EDITION F is the new Brigitte [a popular German women's magazine] but has much more global potential," Christoph Bornschein says. "The team consisting of 11 people knows how to address women in a personal and authentic fashion because it is following an entirely digital approach, uses different marketing channels strategically, and, most importantly, focuses primarily on added value for users." EDITION F currently reaches 350,000 unique users each month. "Our vision is to combine LinkedIn with Medium.com and to create a more emotional medium for women. Three months ago, we enabled users to generate their own content on our platform, and we now have as many as 500 users who have written texts for our platform, some of them very personal and opinionated. These users have provided us not only with content, but also with interaction within our community," Susann Hoffmann says. EDITION will use the latest investment mainly to expand its job market, its sales team, and its community next year. Fabian Kienbaum believes the platform's strong focus on a very specific target group provides great opportunities, "for the advancement of women and diversity will continue to be relevant to companies for a long time. EDITION F is effective in two different ways: Companies may use the platform both to position themselves within a highly relevant target group and to recruit new staff. In other words, on EDITION F, employer branding meets recruiting, both online and offline." For the community in particular, the two EDITION F founders will add many new services. In addition to new features, there will be 24 webinars focusing on topics like career, social media, work-life balance, and specific industry skills. Moreover, EDITION F will host its first conference in the summer. The start-up's "25 women" award and nationwide community events in Germany will connect the members of the EDITION F network both online and offline. Finally, users will have the option to get premium accounts that include a webinar flat rate among other things.